It was certainly a great day when we heard that Kim Good was joining Lancers. Kim has been around Lancers for the past five years as the mother of Kate who currently is in ride two. 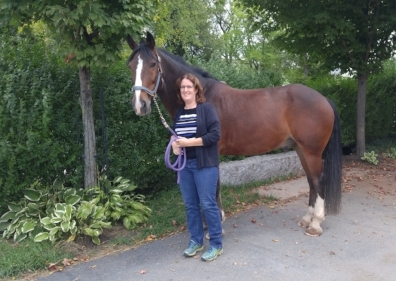 Kim has been riding since she was ten and even had her own horses but had been on a ten year hiatus and had, as she said, been “living vicariously through her daughter’s riding”. That was until someone encouraged her to get back in the saddle because it was crazy thinking that she couldn’t ride and could only watch her daughter ride. So, in the autumn of 2016, Kim started riding at Lancers! She now rides in A3. For Kim, it is the sense of community that makes Lancers special (this is becoming a theme…and we swear we don’t goad our riders into commenting on this)! Kim explains that “it is a nice community, everyone works together and helps and of course, I love the horses”. Kim’s current favourite horse is Oliver and she likes him because he is “adjustable and does what he is supposed to do”. She hopes that (she doesn’t fall off!) and she can keep riding and one day take semi-private lessons with Kate. For Kim, sharing her love of horses with her daughter at Lancers is incredibly special: “it is something that we can share - at an age where teenagers can sometime become distant from their parents, I love that she gets in the car and tells me who she rode and everything that happened”. Kim’s favourite memory from Lancers is when Kate won the 2’6” division last year at the Downtown Horse Show. When not riding or with Kate at the barn, Kim is busy renovating her house and tries to sneak in time for quilting (because it is a good reminder that there is more to life than work). Thank you, Kim, for showing other adults that getting back into riding can be fun and rewarding. Lancers and particularly, the Lancer Pony Club are fortunate to have you!